A burning sensation in your head can be one of the most annoying things. Sunburn or chemical can be the causes. There are some other reasons too, some of which are more serious and require proper diagnosis. Treatment should be given according to the underlying condition. Sinusitis is very common and can affect people of all ages. Some of the symptoms include fever, pain, discomfort in face, head and teeth, and chronic congestion. Some people also complain a burning sensation in their heads, and this has been linked to the widespread inflammation in their sinuses. Another possible cause for burning sensation is trigeminal neuralgia. The trigeminal nerve is the fifth cranial nerve of the body and provides sensation to the face and head. Patients suffering from this condition complain of sharp pain and burning sensation that can occur without warning and persist for a couple of hours. It’s quite difficult to predict when the symptoms will arise. Antibiotics: One of the causes of sinusitis is a bacterial infection, so antibiotics may be the answer if your doctor thinks that is the case. The duration of these antibiotics can vary from a couple of weeks to longer. Painkillers: Regular over-the-counter painkillers such as acetaminophen or ibuprofen can be used. Decongestants: These may be available as pills or nasal sprays. Care should be taken when using them as they can sometimes increase the amount of congestion after a few days. Allergy medicines: Anti-allergic medications like antihistamines can help in relieving sinusitis. Steroids: When the swelling in the sinuses is very serious, steroids through inhalation or by pills may be prescribed. Surgery: For recurrent and persistent sinusitis, surgery may be performed to correct anatomic abnormality. Humidify: Using a humidifier in the rooms where the patient spends lots of time is recommended. Breathe in steam vapors: Steam is an excellent option to help relieve congestion caused by sinusitis. A hot shower or a dedicated steamer is a good option for this purpose. Use warm heat: Applying a wet, warm towel can provide immediate relief for the symptoms of sinusitis. Try a nasal saline solution: Using nasal saline solutions can relieve pain and help in clearing out the mucus. Flush out your sinuses: There are devices available in the market that help in flushing out the sinus. Use a saline solution that is prepared with distilled water for this purpose and ensure that the devices are sterilized prior to each use. Drink lots of fluids: With sinusitis, the body produces an excessive amount of mucus. Having a lot of water will help thin out the consistency of this mucus. Simple things like resting in a quiet room or applying some direct heat to the back of the head are very effective. A neck massage may also help relieve the symptoms. Over-the-counter pain medications such as ibuprofen and naproxen can also help provide adequate pain relief. Some anti-seizure medications like carbamazepine and anti-depressants may be prescribed. For pain that is continuous and uncontrollable, doctors may need to administer steroid and nerve block shots. This is an excellent solution for burning sensation in head. The shots may be a short-term treatment, or may be administered for several weeks. Microvascular decompression to help relieve the pressure on the nerve may also be used for the treatment of occipital neuralgia. Occipital nerve stimulation: This can be used to block the pain messages to the brain. Medications are often used as the first method to reduce the frequency and severity of pain. Anti-seizure medications, muscle relaxants, and antidepressants are often prescribed. Glycerol injections: This injection helps block the transmission of signals from the trigeminal nerve. It is a minor procedure that is carried out on an outpatient basis. Stereotactic radiosurgery: A continuous stream of high-frequency radiation is used to target the root of the trigeminal nerve in an effort to stop the pain signals from being transmitted. Radiofrequency thermal lesioning: This involves the placement of a hollow needle directly to the site of the trigeminal nerve. Once the exact site has been located, the nerve will be destroyed by heating. Gamma-knife radiosurgery: This procedure uses gamma radiation to destroy the nerve. It is precise and effective, and is considered safer than other procedures. Microvascular decompression: The idea behind this procedure is to allow the affected nerves to heal by removing pressure on them. This procedure is much more invasive than others. 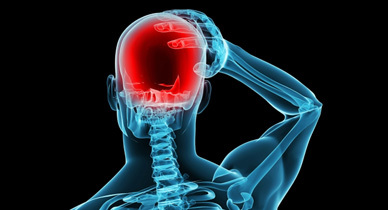 Other options: Some other options to treat trigeminal neuralgia and its symptoms like pain or burning sensation in head include severing the nerve or relocating blood vessels surrounding the nerve.